The Czech Republic (Czech: Česká Republika) is a landlocked country located at the very heart of Central Europe and covers the territory of the historic lands of Bohemia, Moravia and a part of Silesia. It borders with Poland to the North (761.8 km), Germany to the Northwest and West (810.3 km), Austria to the South (466.3 km) and Slovakia to the East (251.8 km). The Czech Republic joined NATO in 1999. It became a full member of the European Union on 1 May 2004, it is a member of the Schengen area since 2007. This small nation boasts a host of spectacular cultural treasures and a varied, rich tapestry of natural wonders. From the physical-geographical point of view the Czech Republic is situated on the divide of two mountain systems of the Bohemian massive and the Western Carpathians. 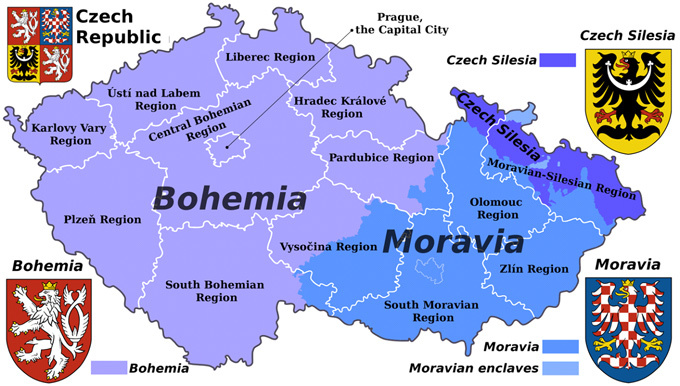 The main European watersheds dividing the river basins of the North, Baltic and Black Seas pass through the territory of the Czech Republic. The natural wealth in the Czech Republic is protected in many areas which have officially been declared nature reserves. On the territory of the Czech Republic there are four national parks (Krkonoše, Šumava, Podyjí and České Švýcarsko). On the territory of the Czech Republic there are numerous cold and hot natural mineral water springs which are used for curative and convalescent treatments in areas where there are also spas. Thanks to Czech Republic position in the heart of Europe the country has been confronted with various cultural influences and architectural styles in the course of its history. Since the country suffered little damage during the World War II, nor destruction due to redevelopment projects, a rich cultural heritage has been preserved.